In another quick shift in the hyper-competitive performance video card market, AMD sends word this afternoon that they are enacting some price cuts that will be taking effect later this week. This latest round of price cuts comes hot on the heels of last week’s launch of the GeForce GTX 660 Ti, which saw NVIDIA introduce their first 28nm performance video card at $299. The bulk of the cuts here will be for the 7800 series, where the 7870 in particular is finding itself somewhat displaced after the launch of the GTX 660 Ti. The $299 660 Ti isn’t necessarily in direct competition with the already-cheaper 7870 – which had a street price of around $279 last week – and since AMD had already quietly shuffled prices around ahead of the GTX 660 Ti launch, we weren’t expecting any further changes here. But it would appear that the gap between the 7870 and GTX 660 Ti is closer than AMD would like. As a result the 7870 will be getting a slight price cut to push prices towards $249. This would make the card a full $50 cheaper than the GTX 660 Ti, which is apparently the kind of leverage AMD wants right now. Meanwhile because the 7870 is getting a price cut, so is the 7850. AMD is expecting the street prices on the 2GB 7850 to fall to around $209 after the price cuts take effect, putting it $40 below the newly repriced 7870. The 2GB 7850 has been averaging $239 in the past week, so this would represent a price cut of around $30. Meanwhile the extremely rare 1GB version of the card would end up below $200, though given how few of those cards exist it’s hard to say if it will hit AMD’s $189 price target. Alongside those price cuts the 7800 series will be receiving a new game bundle promotion in a few weeks. The AMD Gaming Evolved title Sleeping Dogs will be AMD’s latest bundle, replacing the outgoing DiRT Showdown bundle. This will sit opposite NVIDIA's existing Borderlands 2 promotion, which went live last week. As with past bundles this is being done at a retailer level, so it’s primarily geared towards online retailers (e.g. Newegg) that can quickly bundle vouchers with new cards. Meanwhile, along with the 7800 series the 7950 is also technically getting a price cut. We say “technically” because AMD seems to be rubber stamping price cuts that have already happened. The 7950 has been readily available below its $349 MSRP for quite some time now, and AMD’s new MSRP of $319 reflects the price of cards that are already available. Finally, it should be noted that despite AMD’s official announcement we wouldn’t be all that surprised if only a few cards ended up reaching these new MSRPs. 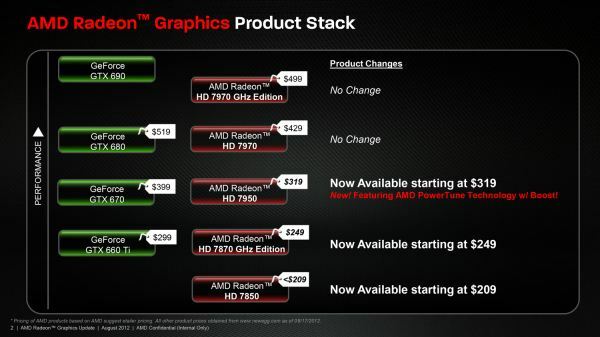 AMD lists their MSRPs as “starting at”, which means that AMD is listing the price of the cheapest card. This is largely how the previous round of price cuts played out, so pickings right at these new MSRPs may be slim. It is a nice move, but the price/performance ratio in my opinion still doesn't match the previous 6000 series, I picked up 2x Radeon 6950 2gb cards which unlocked into 6970's (Then I overclocked them) and they each came with a copy of Dirt 3 for about $200Au a year ago. Sold 2x copies of Dirt 3 each for $60 so in the end each card was about $180. The 6970's are competitive to the 7870 in allot of games that aren't compute heavy. They were, and are. The fact they existed led to me being very confused at the success of the Geforce 560Ti, a card with far less potential (and VRAM). The performance difference was maybe 10%, mostly due to different clocks. Clock to clock the difference between 6970 and 6950 was 0-5%. In any case, the 200$ market hasn't moved since in terms of performance. I bought two of them and sold them for maybe 50€ less a year later. CrossFire was a big disappointment for me. No driver support whatsoever back then. They were the $300 to $400 dollar market, not the $200 market. How the HECK do you people do that ?